Slow, dull, and nothing that we haven’t seen before. 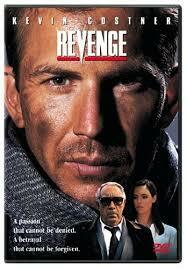 Revenge is a Tony Scott movie and one that he made in between top gun and true romance. It was right during his transition period from the days of tony Scott: the classic sports and competition filmmaker (Days Of Thunder) and Tony Scott: the action, hip, gun-fight movie-maker (The Last Boyscout.) he was still working things out when he made this movie, still trying to find his way, and it shows. The movie is flawed beyond belief, but there’s no question that there was a vision here and an idea, and it just wasn’t handled the way it should have been. Here, in revenge, she has her eyes on Cochran. He goes down there to Mexico, and for the first half of the movie, it’s just the two of them exchanging looks or bits of conversation that show us there is a connection. We can see what’s going to happen from a mile away, and yet it feels like it never does. This movie takes so long for just the very first plot point to come out, that we lose patience and stop caring about it. I suppose the first half is really just about Cochran going down there, his relationship and friendship with Tobey, and how he seems to be moving in the direction of something happening with Tibey’s wife. And it does. After a long, long time, Cochran and Miryea start to get it on. Finally. Then they decide to go away together for a weekend. What the hell are they thinking? Cochran makes up a story of where he’s going and Midyear makes up a story to tell her husband about where she will be too. Only Midyear calls up a friend to cover for her and of course when she makes a phone call from Tibey’s estate, it is being tapped and listened to, and she is being very stupid. Now the movie has gotten interesting. It certainly took long enough, but better late than never. Cochran and Midyear meet up at an airport and drive to his cabin together and when they get there, they immediately hop in the sack with each other. That’s when Tobey and his men show up and beat the hell out of both of them. They leave Cochran within an inch of his life. And for Midyear they cut and scar her face and then bring her to a brothel where she will spend the rest of her days living and working as a prostitute. That moment of Tobey and his men showing up at the cabin was scary and violent and a solid jolt of energy that this movie desperately needed. But once they go away, the movie dies down again and goes right back to being a slow and boring film. Now we join Cochran as he is nursed back to health by a kind older man (always a kind older man, what a cliché), and then gets back on his feet and looks to get revenge against Tobey. We’ve seen revenge movies like Vin Diesel’s A Man Apart, or Thomas Jane in The Punisher, or Scott’s own movie, Man On Fire with Denzel Washington. They are always better than this movie. That’s because they involve elaborate situations of having to kill more and more people to get up the ladder and either uncover the mystery or just to get to the big boss. 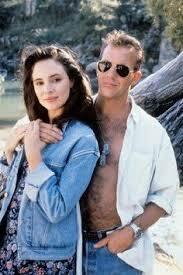 Tony Scott’s revenge, has very little of that. Yes, Cochran runs into one of the men at a bar and kills him, but that’s about it. This is clearly Scott’s first attempt at a revenge movie and it doesn’t go so well. There are a lot of problems or holes in this movie. One is how Cochran and Tobey know each other and became friends in the first place. Apparently Cochran saved Tibey’s life once while they were out hunting, but that’s not enough information. Why were they hunting together? How do they really know each other? And then if Cochran really were to come down to his friend’s drug estate, wouldn’t be on his guard a little? Wouldn’t he say to himself, “hey, this guy is a drug lord, I better be careful around him?” the last thing he would do is sleep with the man’s wife. Another problem is when Tobey finds out about the weekend getaway plan and goes to Cochran to ask him for a favor that weekend. He practically begs Cochran to help him with something, and Cochran still refuses. At a certain point, you call off the weekend getaway, just because you can tell that maybe the guy is onto you, and you take him. Instead, Cochran’s reason for not canceling, “I’ve already go it into my mind that I’m going to the cabin.” are you serious. That means there’s not even something he has to do, he just doesn’t feel like canceling. It’s the weakest and least creative excuse of all time. Another major plot hole is that somehow after busting in on them, Tobey leaves both Cochran and Midyear alive. It’s just not believable. Maybe if they shot Cochran, thought he was dead, left his body in the burning cabin, left some guys to stay and watch the cabin, and then Cochrin pulled out a hand grenade and threw it out the window at them while he escaped out the back. Maybe then. But to just leave him still alive makes no sense at all. With that said, I do like the punishment they gave the girl, turning her into a drug addict and a prostitute. It reminds me of the sort of thing they did to the women they kidnapped in taken. That element was certainly scary. And some of things that happen at the very end of the film are creative too, but by that point it’s too little, too late. The plot of the movie is lousy in the first half and only gets slightly better in the second half. It’s long and slow and maybe it’s artistic, but I don’t really care. It’s certainly not original or fresh at all and it’s riddled with problems.